We�re pleased to announce that the U.S. Bureau of Land Management (BLM) has granted a five-year extension of the company�s oil shale Research Development & Demonstration (RD&D) lease on 160 acres of federal land next to our private property in the southern Uintah Basin. RD&D leases were created to encourage private companies to research and develop ways to produce liquid fuels from oil shale and then commercialize the resulting technology. 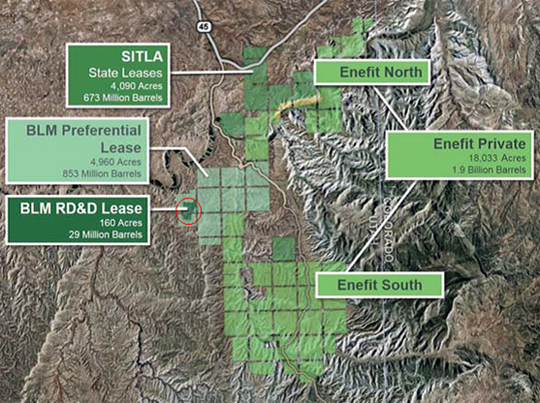 Enefit acquired an existing RD&D lease as part of its purchase of private property, options and leases from another oil shale company in 2011. �EAO has met the requirements of the provision of its RD&D Lease authorizing a five-year extension of the lease terms, and granting the extension is in the public interest and consistent with energy policy of the United States,� BLM Utah State Director Edwin L. Roberson writes in the Record of Decision signed June 27, 2017. Roberson�s decision extends the lease to June 30, 2022. Scott Pruitt, recently confirmed as President Trump�s pick to lead the U.S. Environmental Protection Agency, visited Utah in mid-July to seek input on a variety of issues, including a 2015 water regulation that has led to uncertainty for mining companies and other industries. EAO Head of Development and Environment, Ryan Clerico and Utah Mining Association (UMA) President Mark Compton had the opportunity to participate in a roundtable discussion with Administrator Pruitt on the Waters of the United States, or WOTUS, rule. Rikki also serves on UMA�s board of directors. The WOTUS rule, enacted during the Obama Administration, effectively extends federal oversight to virtually all bodies of water � including seasonally dry creek beds, drainage ditches and puddles. US EPA Administrator Scott Pruitt (left) during his visit to Utah in mid-July. EAO and Utah Mining Association President Mark Compton were among those to meet with Pruitt about potential changes to environmental regulations. Farmers, miners and other interests have sought a clearer definition of waters affected by the controversial rule since it was first proposed. Administrator Pruitt, who criticized the rule during his tenure as Oklahoma�s attorney general, said he favors clarifying, and, perhaps, limiting the regulation. The roundtable discussion also touched on a number of other issues important to UMA, EAO and the mining industry in general, including federal permitting delays, the dangerous reliance on foreign sources of minerals for the nation�s manufacturing base, energy needs and national defense, and proposed rules dealing with cleanup of closed mines. Construction recently began on the Kingdom of Jordan�s first oil shale-fired power station and open cast oil shale mine. Enefit affiliate Attarat Power Company (APCO) secured $2.1 billion in funding for the project, notable for being the largest-ever private financing deal in the world�s oil shale industry. Operation of the new power plant is set to begin in mid-2020. Enefit has shepherded this project since receiving a concession agreement from the government of Jordan � including all exploration, engineering and related tasks, such as bringing on strategic and financial partners at the right stages. The project clearly demonstrates Enefit�s ability to successfully develop a greenfield project outside of the company�s home country of Estonia. In addition to developing the power plant, Enefit is also seeking to produce liquid fuels from Jordanian oil shale, similar to the company�s Utah Project. To facilitate this, the company has signed a 40-year exploration and production agreement with the Jordanian government. The listing was agreed in the Estonian government's coalition agreement in last November. See you at the Uintah Basin Energy Summit! The annual Uintah Basin Energy summit takes place in Vernal on August 30th and 31st. EAO CEO Rikki Hrenko-Browning and Head of Development and Environment Ryan Clerico both plan to attend and look forward to discussing the state of the energy industry with state and local officials, company executives, contractors and researchers and other attendees. In addition to updates on all things energy-related in the Uintah Basin, attendees will hear from keynote speaker Robert Rapier, Director of Alternative Fuels Technology at Advanced Green Innovations in Phoenix, Arizona. Rapier is the author of Power Plays: Energy Options in the Age of Peak Oil and serves as Chief Investment Strategist for The Energy Strategist, part of the Investing Daily newsletter group. For more information about the Summit contact swilkins@uintah.utah.gov.